Friday, Lent Wk 4: "You have faith in God"
have faith also in me. For a Christian, believing in God cannot be separated from believing in the One he sent, his "beloved Son", in whom the Father is "well pleased"; God tells us to listen to him. The Lord himself said to his disciples: "Believe in God, believe also in me." We can believe in Jesus Christ because he is himself God, the Word made flesh: "No one has ever seen God; the only Son, who is in the bosom of the Father, he has made him known." Because he "has seen the Father", Jesus Christ is the only one who knows him and can reveal him. Art: El Greco, Pope St. Pius V.
S Catherine of Siena: "whoever receives the one I send receives me"
Wednesday, Easter Wk 4: "I came into the world as light"
Tuesday, Easter Wk 4: "you do not believe"
The signs worked by Jesus attest that the Father has sent him. They invite belief in him. To those who turn to him in faith, he grants what they ask. So miracles strengthen faith in the One who does his Father's works; they bear witness that he is the Son of God. But his miracles can also be occasions for "offence"; they are not intended to satisfy people's curiosity or desire for magic Despite his evident miracles some people reject Jesus; he is even accused of acting by the power of demons. Monday, Easter Wk 4: "the Gentiles too had accepted the word of God"
Christ chose to be born and grow up in the bosom of the holy family of Joseph and Mary. The Church is nothing other than "the family of God." From the beginning, the core of the Church was often constituted by those who had become believers "together with all [their] household." When they were converted, they desired that "their whole household" should also be saved. These families who became believers were islands of Christian life in an unbelieving world. 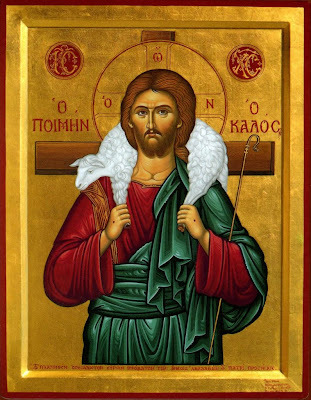 Good Shepherd Sunday: “My sheep hear my voice"
The bishop is the first reference for those who seek to hear the voice of Jesus the good shepherd. "Let all follow the bishop, as Jesus Christ follows his Father, and the college of presbyters as the apostles; respect the deacons as you do God's law. Let no one do anything concerning the Church in separation from the bishop." 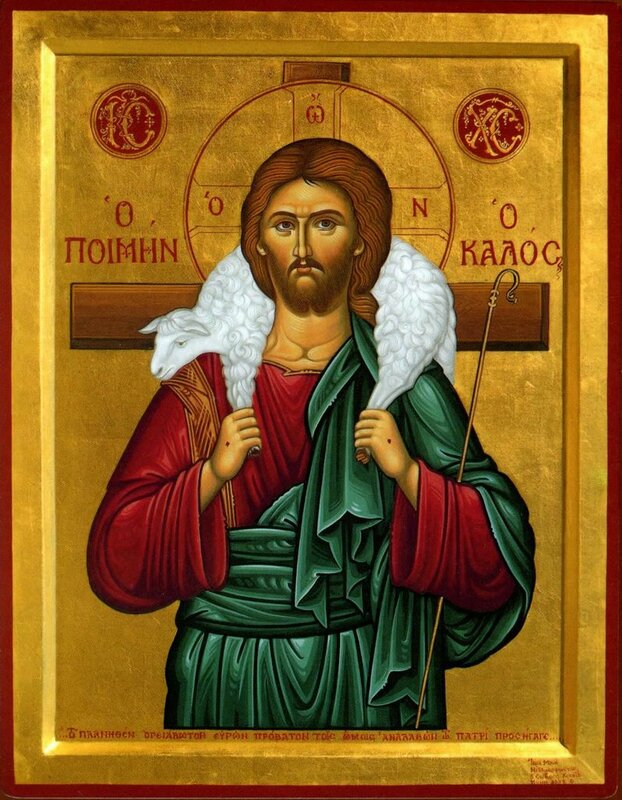 The parish priest shares in the ministry of the bishop and is thus appointed to pastoral care for a portion of the flock of God in union with the bishop. The priest exercises the ministry of reconciliation through forgiveness of sins. "When he celebrates the sacrament of Penance, the priest is fulfilling the ministry of the Good Shepherd who seeks the lost sheep, of the Good Samaritan who binds up wounds, of the Father who awaits the prodigal son and welcomes him on his return, and of the just and impartial judge whose judgment is both just and merciful. The priest is the sign and the instrument of God's merciful love for the sinner." The flock hears Christ's voice through the handing on of revelation through Scripture and Tradition. to share in the work of your Son." 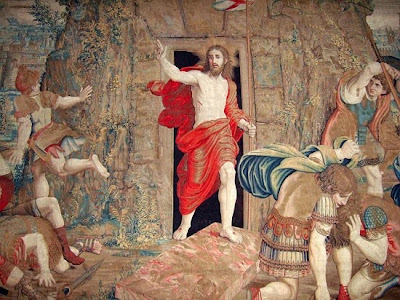 Saturday, Easter Wk 3: "Peter was passing through"
The risen Lord renews this mission ("In my name . . . they will lay their hands on the sick, and they will recover.") and confirms it through the signs that the Church performs by invoking his name. These signs demonstrate in a special way that Jesus is truly "God who saves." 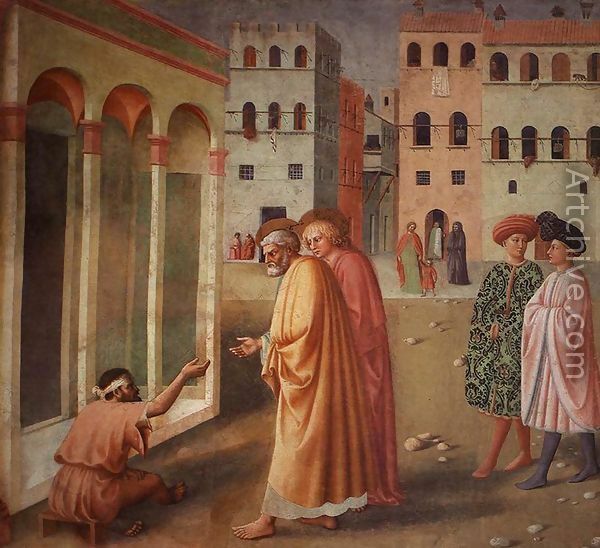 Art: Tommaso Masolino (da Panicale), Saint Peter Heals a Cripple, 1424-25. Optional memorial of St. George. Then Philip opened his mouth and, beginning with this Scripture passage, he proclaimed Jesus to him. Wednesday, Easter Wk 3: "There broke out a severe persecution of the Church"
Tuesday, Easter Wk 3: "you always oppose the Holy Spirit"
They put to death those who foretold the coming of the righteous one, whose betrayers and murderers you have now become. Monday, Easter Wk 3: "They presented false witnesses"
Third Sunday of Easter: "Peter, do you love me?" 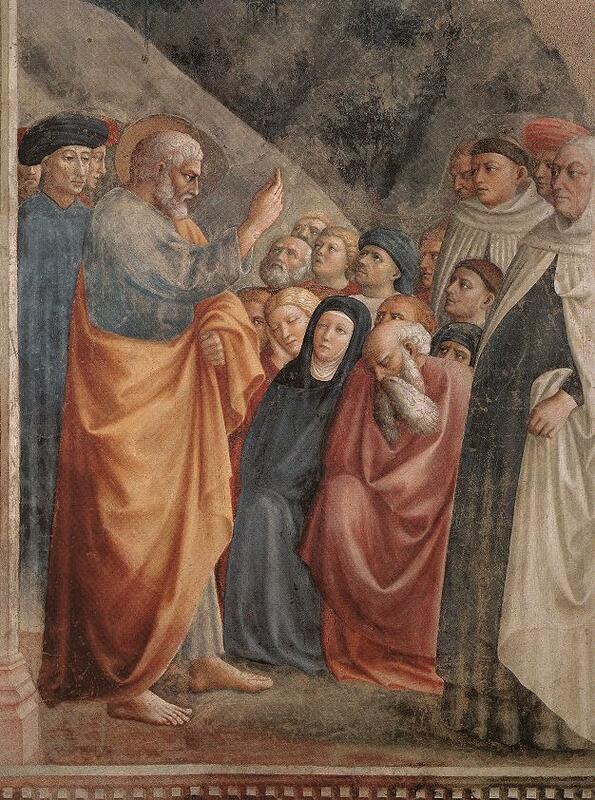 Peter is commissioned by Christ who commands: "Follow me." In the reading from Acts we find that Peter and the Apostles suffer for obeying God rather than men, for following Christ and speaking with His voice. That the voice of God may not be silenced in the world today the Lord sends Pope Benedict, successor of Saint Peter, who speaks with the authority of Christ when he teaches in matters of faith and morals. 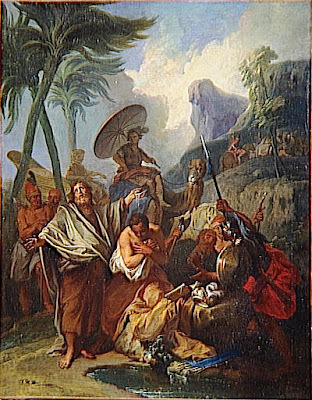 Peter feeds the flock of God with the food of salvation. 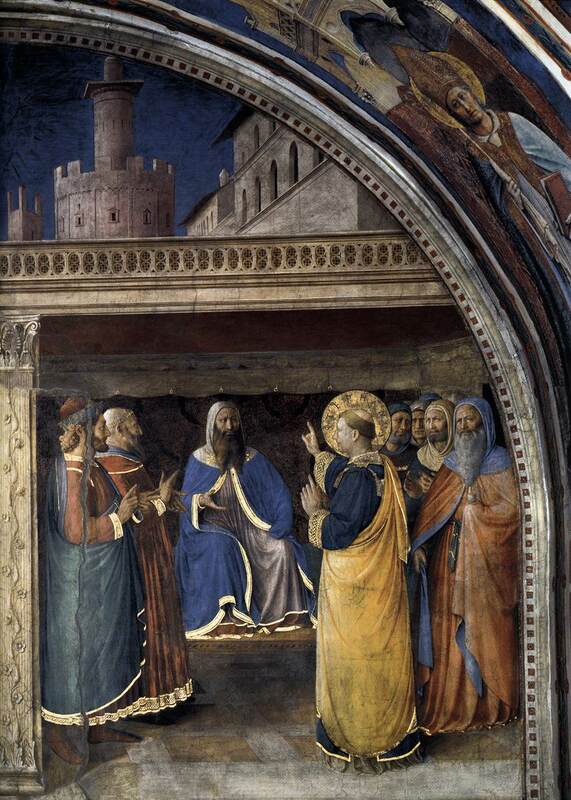 This authority, given to Peter, was to be handed on through the "apostolic succession". 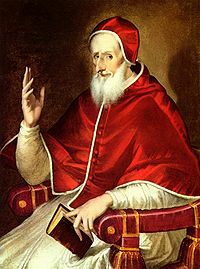 Our Holy Father, the bishop of Rome, and all of the bishops in union with him, are the duly-appointed successors of the apostles. Saturday, Easter Wk 2: "the word of God increased "
Among the religious authorities in Jerusalem, not only were the Pharisee Nicodemus and the prominent. 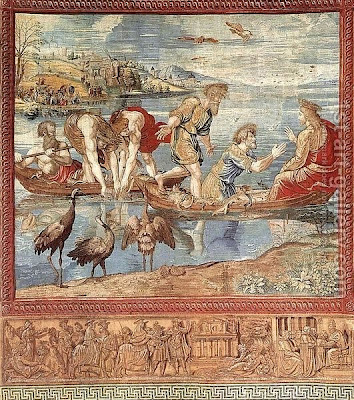 Joseph of Arinethea both secret disciples of Jesus, but there was also long-standing discension about him, so much that St John says of these authorities on the very eve of Christ's Passion, "many believed in him," though very imperfectly. 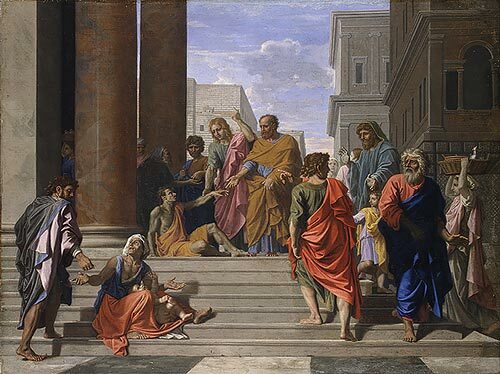 This is not surprising, if one recalls that on the day after Pentecost "a great many of the priests were obedient to the faith"
Friday, Easter Wk 2: The Apostles rejoiced "that they had been found worthy to suffer"
dishonor for the sake of the name. Thursday, Easter Wk 3: “We must obey God rather than men"
Tuesday, Easter Wk 2: "The community of believers was of one heart and mind"
"They had everything in common." "Everything the true Christian has is to be regarded as a good possessed in common with everyone else. All Christians should be ready and eager to come to the help of the needy . . . and of their neighbors in want." A Christian is a steward of the Lord's goods. 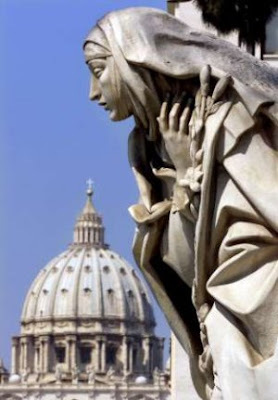 Monday, Easter Wk 2: "As they prayed, the place where they were gathered shook"
Is it purely by coincidence that the uproar around the world against the mishandling of decades-old cases of sexual abuse rears its ugly head in Passiontide and Easter? I think not. Human nature has not changed. The evil of violent hatred is aroused by the mercy of Jesus Christ, present in His Mystical Body, the Church today as much as on the via crucis in Jerusalem on the day of the Lord’s Passion and death so many years ago. Those columnists and newspapers, television news outlets and others, who passionately position themselves as the righteous defenders of abused persons need to ask themselves: Where were you in 1975, or 1985 or 1995 or 2005, when these alleged cases of malfeasance could have been pursued with full rigor — and with greater effectiveness when any alleged malefactors involved would have still been alive to face justice? The record shows, for those interested in the truth, that it was Benedict, known then as Cardinal Ratzinger, who was in the forefront of those within the Church who were cleaning up the filth despite great opposition from others also within the Church. But the evil of hatred on the part of these media personnel and so many others prevents them from critical objectivity and discredits the campaign for justice they endlessly pursue with shoddy research and erroneous information they have cut and pasted from other equally unreliable sources. It is the mercy of Jesus Christ in His Church — for both victims of abuse and abusers, for clergy and laity, for bishops and priests — that scandalizes these haters the most. It is a faithless lack of mercy that attacks Cardinal Ratzinger, if what is alleged is indeed true, for allowing an aged and dying priest, certified to be no longer a threat to young people, to finish out his days with an opportunity to avail himself more thoroughly of the Lord’s mercy if he indeed judged that such a decision best reflected both God’s justice and mercy. 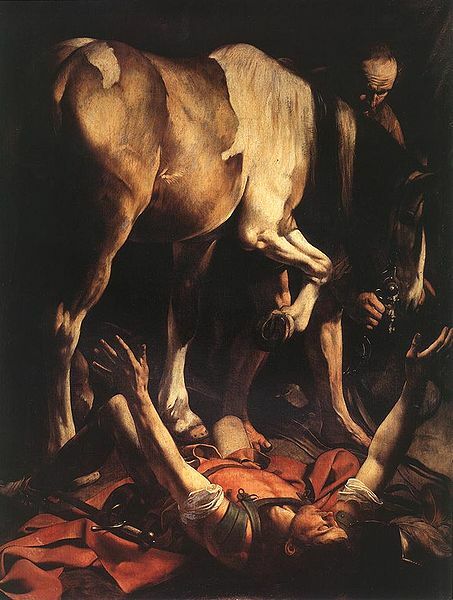 “It is precisely in the Passion, when the mercy of Christ is about to vanquish it, that sin most clearly manifests its violence and its many forms: unbelief, murderous hatred, shunning and mockery by the leaders and the people, Pilate’s cowardice and the cruelty of the soldiers, Judas’ betrayal — so bitter to Jesus, Peter’s denial and the disciples’ flight. However, at the very hour of darkness, the hour of the prince of this world, the sacrifice of Christ secretly becomes the source from which the forgiveness of our sins will pour forth inexhaustibly” (Catechism of the Catholic Church, n. 1851). The Church is the Mystical Body of Jesus Christ and the source of the mercy of God: “Thus a true filial spirit toward the Church can develop among Christians. It is the normal flowering of the baptismal grace which has begotten us in the womb of the Church and made us members of the Body of Christ. In her motherly care, the Church grants us the mercy of God which prevails over all our sins and is especially at work in the Sacrament of Reconciliation. With a mother’s foresight, she also lavishes on us day after day in her liturgy the nourishment of the Word and Eucharist of the Lord” (CCC, n. 2040). Hatred is an evil which blocks and denies the mercy of God in Jesus Christ who only has the power to vanquish this and every evil in and through His Sacrifice on the cross. Hatred is overcome only through the grace of forgiveness. “Now — and this is daunting — this outpouring of mercy cannot penetrate our hearts as long as we have not forgiven those who have trespassed against us. Love, like the Body of Christ, is indivisible; we cannot love the God we cannot see if we do not love the brother or sister we do see. In refusing to forgive our brothers and sisters, our hearts are closed and their hardness makes them impervious to the Father’s merciful love; but in confessing our sins, our hearts are opened to His grace” (CCC, n. 2840). The Lord lives out His Passion here and now in the life and grace of the universal Church. Evil continues to show its face in the violence of murderous hatred on the part of many who have vociferously attacked the Holy Father and the Church in recent weeks. Let us pray for Pope Benedict who will one day face God and who will ask him if he stood up for and proclaimed God’s mercy for every human person, without exception: both for persons guilty of the very great evil of sexually abusing others and for those persons who have suffered abuse of every kind. 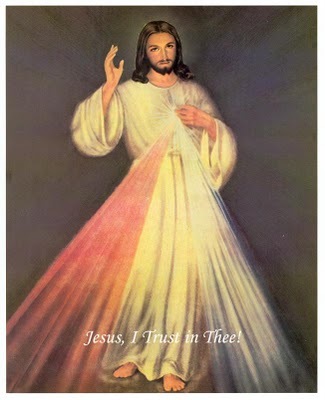 He will be judged as the vicar of Divine Mercy also for the sake of the irresponsible who repeat the erroneous gossip of dominant opinions in their assault against Jesus Christ once again truly present in His Church. And he will also be called to account for justice and mercy in regard to those with power in the Church who may have failed to do all in their power to protect children and young persons from those whom evidence showed to be guilty of the sin of abuse. Divine Mercy is a scandal to unbelievers today as it has always been. Let us pray for mercy for the whole world, that agents of hatred will lay down their arms and use their power instead to sow peace and solidarity among nations and peoples and refuse any longer the sin of inciting the evil of murderous hatred against Jesus Christ, truly present in the Mystical Body of Christ, His Church, and actively pouring out the infinite graces of His Divine Mercy for us and for the whole world. In God love mercy and justice are never mutually exclusive. Let us pray for our Holy Father Benedict, that he may ever grow in the wisdom and love of Jesus Christ, our Divine Mercy who is also the Just One. Let us pray for ourselves that, as one with the Holy Father and the universal Church, we may spread the "scandalous" and wonderful merciful love of Jesus Christ every day and in every way. This column was published in the 8 April 2010 issue of The Wanderer Catholic Newspaper. Visit the website by clicking here for more information about subscribing to the electronic or print editions of The Wanderer. they called them back and ordered them not to speak or teach at all in the name of Jesus. It is impossible for us not to speak about what we have seen and heard. That which was from the beginning, which we have heard, which we have seen with our eyes, which we have looked upon and touched with our hands, concerning the word of life - the life was made manifest, and we saw it, and testify to it, and proclaim to you the eternal life which was with the Father and was made manifest to us- that which we have seen and heard we proclaim also to you, so that you may have fellowship with us; and our fellowship is with the Father and with his Son Jesus Christ. And we are writing this that our joy may be complete. "Jesus Christ the Nazorean...has become the cornerstone"
Art: Nicolas Poussin, Saints Peter and John Healing the Lame Man, 1655. New York: The Metropolitan Museum of Art. "The author of life you put to death"
... but God raised him from the dead; of this we are witnesses. The frequent New Testament affirmations that Jesus was "raised from the dead" presuppose that the crucified one sojourned in the realm of the dead prior to his resurrection. This was the first meaning given in the apostolic preaching to Christ's descent into hell: that Jesus, like all men, experienced death and in his soul joined the others in the realm of the dead. But he descended there as Savior, proclaiming the Good News to the spirits imprisoned there. 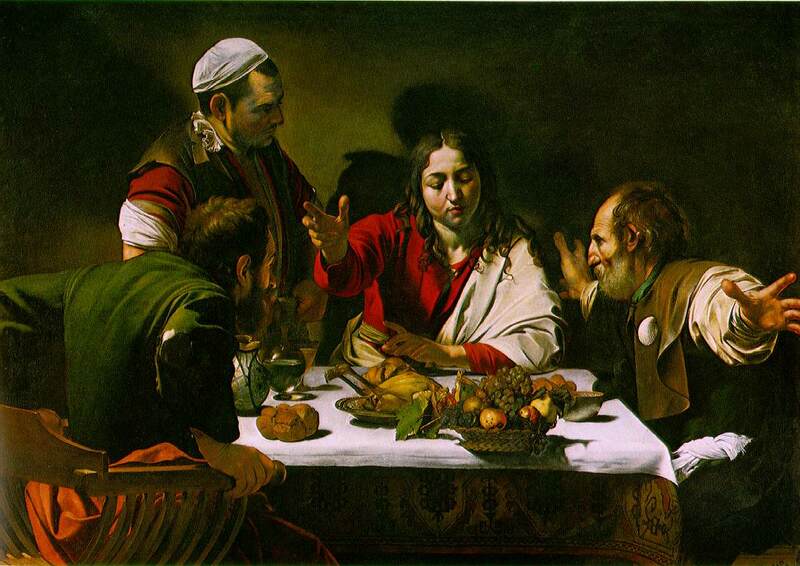 And it happened that, while he was with them at table,he took bread, said the blessing,broke it, and gave it to them.With that their eyes were opened and they recognized him,but he vanished from their sight. "God has made him both Lord and Christ, this Jesus whom you crucified"
. . . [N]either all Jews indiscriminately at that time, nor Jews today, can be charged with the crimes committed during his Passion. . . [T]he Jews should not be spoken of as rejected or accursed as if this followed from holy Scripture. 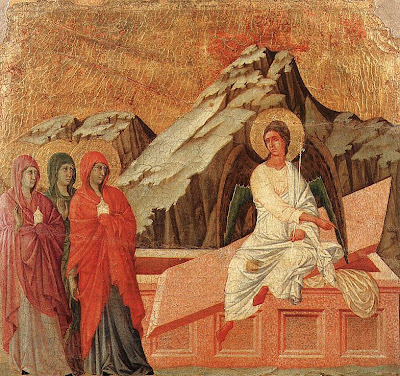 "Mary Magdalene and the other Mary went away quickly from the tomb"
... fearful yet overjoyed, and ran to announce the news to his disciples. Mary Magdalene and the holy women who came to finish anointing the body of Jesus, which had been buried in haste because the Sabbath began on the evening of Good Friday, were the first to encounter the Risen One. Thus the women were the first messengers of Christ's Resurrection for the apostles themselves. 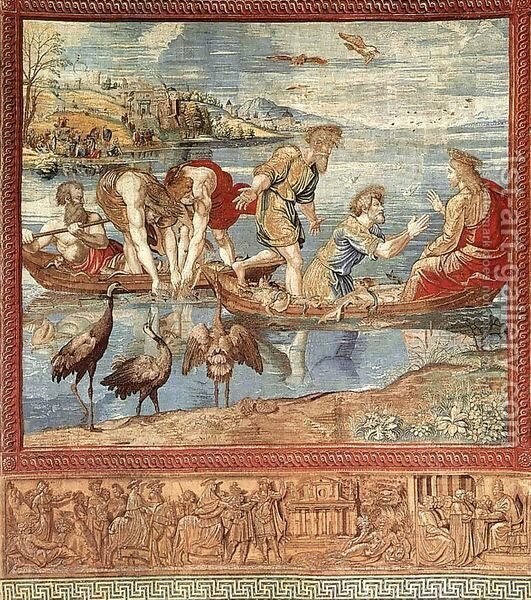 They were the next to whom Jesus appears: first Peter, then the Twelve. Peter had been called to strengthen the faith of his brothers, and so sees the Risen One before them; it is on the basis of his testimony that the community exclaims: "The Lord has risen indeed, and has appeared to Simon!" “This Jesus God raised on the third day" Alleluia! 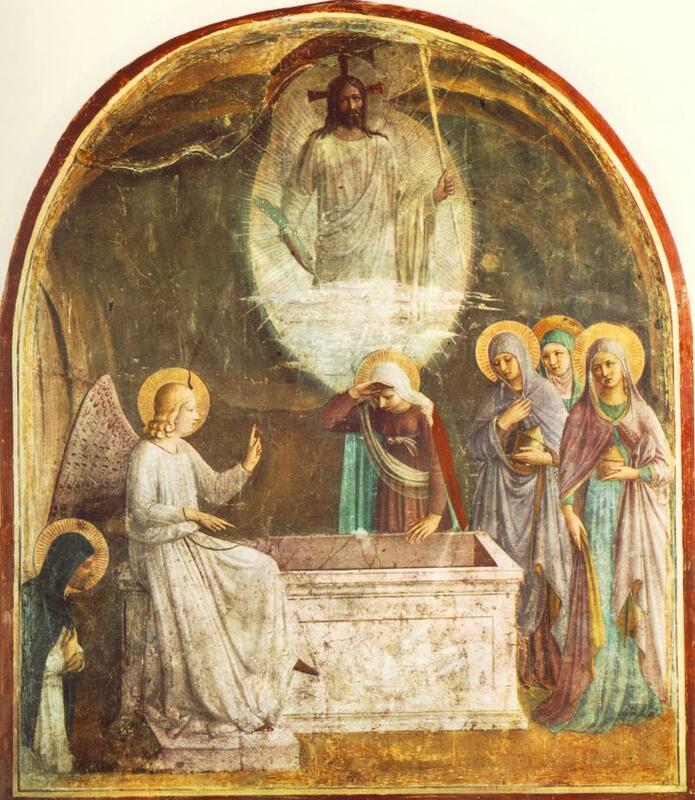 Holy Saturday: "For thou dost not give me up to Sheol"
 Preserve me, O God, for in thee I take refuge. I have no good apart from thee." Sculpture: Veiled Christ, Naples, Italy.